I’m not. I’m stuck back in the middle of March. Every time I see a calender, I break down in hysterical sobs. So much yet undone, so much more being piled on my plate, and I’m supposed to be writing a book in the middle of this chaos? Ready… Take a look at your schedule for September – December. What weeks will be crazier than most? What can you do ahead of time to avoid extra craziness? Today’s prompt: The key to staying focused on your writing when you are living in the middle of a sea of swirling blender blades is to stay focused on one aspect of your story. If you know you’re going to have one of those days, consult your list, pick a statement and refer to it all day. Tape it to the dashboard. Record it on your phone and turn it into a ringtone. Sing it while stuck in traffic. Turn it into a mantra so that your subconscious can work on uncovering ways to further this aspect of your story and will have them all lined up and ready when you sit down to write. Boy, did I need this today! Thanks so much! 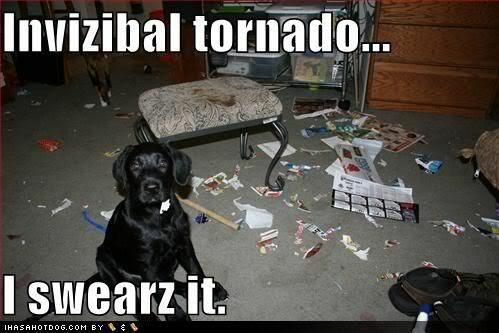 I hope your Invizibal Tornadoes settle down! Perfect post! I’m getting ready to start teaching again in one week. I feel like I’m getting ready to be thrown into a blender and worried about how my writing will fall apart when the puree button is pressed on Monday. Even though I’m not a writer, just a humble school librarian, your post was perfectly spot on! This is exactly the way I’m feeling! The summer’s over and so much left undone……. I’m going to do what you suggest and make a plan for September to December. Writers are so wise…..Thank you (and best wishes from the North Country)! You know… I can get a great deal more done when I take a deep breath and realize that I’m not alone in being swamped, being interrupted (with the best of intentions, of course), and losing my focus on my stories. It doesn’t help and does help all in the same breath to be fleshing out two stories at the same time. Thanks so much for being there with us this month. Previous PostPrevious WFMAD Day 20 – Stuck in a rut?